What’s a perfect way to purchase a watch that you like, yet still being able to stand out from the crowd? Changing up the dial color is one option. Blue dial watches break from the tradition of timepieces coming in shades of black or white. 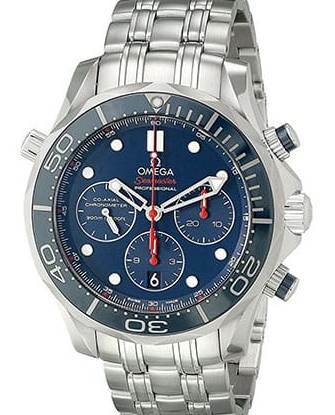 Instead, blue dials carry a masculine feel and can be worn with business clothes but also in a more casual setting as well. 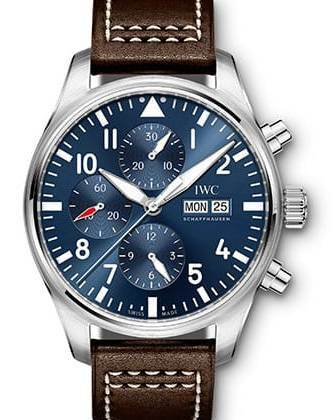 One such example is IWC Pilot’s chronograph edition Le Petit Prince is one such blue dial watch that shows its versatility. 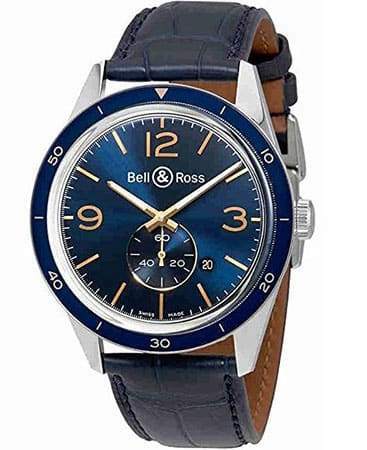 With its stainless steel case, brown leather strap and silver hands on top of the blue dial, the watch exudes a sleek look. The watch also gets the job done from a functionality standpoint with three subdials for hours, minutes and seconds. 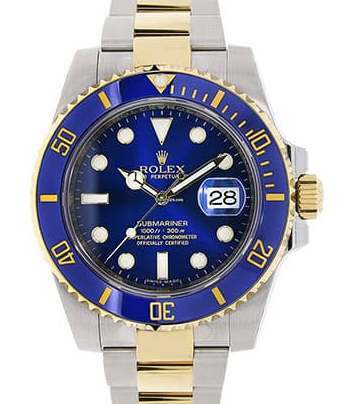 Rolex came into the blue dial foray in 2013 when it released Day-Date watches in five different colors. The blue version of the Day-Date comes fully equipped in an 18k white rose gold case. A watch that truly shows it can be worn for many different occasions is Hublot’s Big Bang Jeans Ceramic. 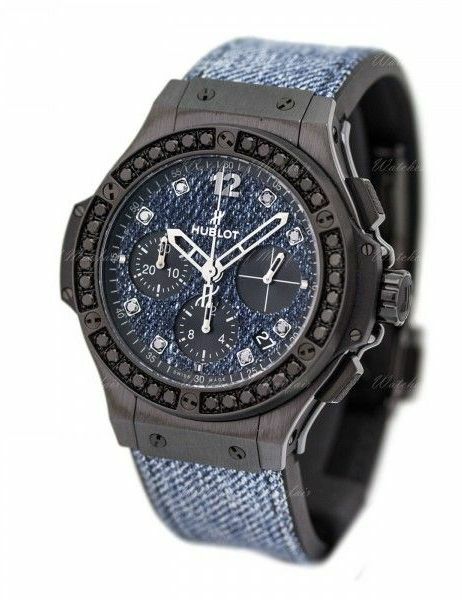 With a 41-mm case, the dial and band are made from blue jeans denim, showing the watch can be worn for high class (it’s an Hublot, after all) or while doing afternoon chores outside. More watches with blue dials. My Seiko Bell-matic in the ’70’s had a blue dial. Love blue dials. And green dials and brown dials and… One of my favorites right now is my Citizen AT4000-53L Eco Drive atomic – stainless band with a blue dial. Although Citizen still makes this style in black I haven’t seen the blue dial model available for several years. I don’t like blue dials. 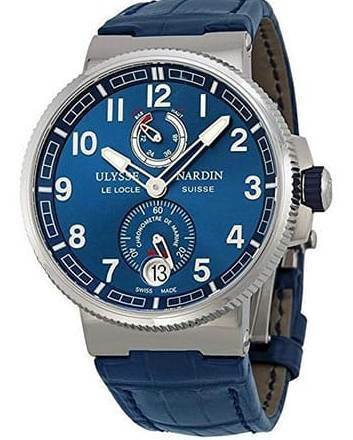 On the other end of the price spectrum of “Watches with blue dials” is the Vostok Submarine Commander. This is a surprisingly handsome watch, and sells new for south of $100. It is thoroughly old-tech, being based on a pre-war design and first manufactured in 1942. Is it a “fine” watch? No. Is it a decent watch? Just – it tells the time, is reasonably accurate, and it looks pretty good. If you lose it, drop it, or it “grows legs”, you aren’t out a lot of money, and you can just go get another one. you might consider it the “Russian Timex”. I have the Vostok black face diving watch. Mark told me it’s not a good watch. I purchased it when my Rolex Submariner went vintage and now wear it as a day watch that can be worn when I’m swimming. However I heard the Vostok called the Russian Rolex as I believe that the Russians got hold of one in 1942, reverse engineered it, and built new parts for their military divers. The watch appears to be old technology with low quality case and strap but it works. My Date Just was featured in one of your articles a while back since I sent it to Rolex ad got a wildly expensive estimate. You fixed my watch up and it has been keeping perfect time all along. My face is silver that was repainted by Kirk Dial years ago, but I have to say if I could get an original blue Rolex dial, I would switch. If anyone knows where to get one, I would love to have Mark change mine out. I get to drive to Kane again and have a visit as a bonus! Thanks Mark. Curt from Pittsburgh.